In the Malayalam language "kettu" means "to tie" and “vallam” means boat – the two together make the local name "kettuvallam”. Each houseboat is constructed using the ancient principles and techniques of boat building by the local carpenters using 'Anjili' wood. Coir ropes are used for tightening the wooden planks together. Boats in a variety of shapes and sizes have traditionally been the main means of transport of men and materials in the Kerala backwaters since olden days. 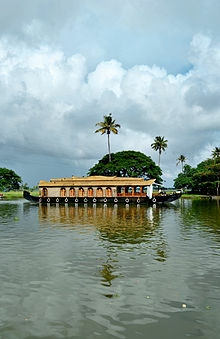 In particular, the house boats were used to ship rice and spices and other goods between Kuttanad and the Cochin port. It was a three-day affair in those days. A standard house boat, which could be about 100 feet long, can hold up to 30 tons, about as much as three big lorries can carry. For the royalty these boats even became comfortable living quarters. It was the important mode of transportation in coastal Kerala just because of its accessibility to the most remote areas. However, the scenario changed. Motorized road, rail and air transportation scored over the slow and staid country boat, with people opting for speed. A kettuvallam is about 100 feet in length and has a width of around 13 feet in the middle. The materials that go into the making are local and ecofriendly; bamboo poles, coconut fibre, ropes, bamboo mats, carpets etc. The main wood used is "Anjili" (Artocarpus hirsuta). There are houseboats with fully furnished single room, double room and triple rooms. The hull is a series of wooden planks, long cut and carved, tied together using coir with coconut fibers stuffed in between. The hull which is made of hundreds of fine but heavy-duty planks of jack-wood is held together absolutely by coir knots (not a single nail is used). This framework is then coated with a caustic black resin extracted from boiled cashew kernels. And it lasts for generations. The kettuvallam is motorised and is steered in deep waters by means of oars. Long bamboo poles or 'punts' are used to propel in shallow areas. Bamboo beams sprouting off on the sides are used as footholds for the same. Bamboo is used for the framework of the roof and splits of bamboo are used for weaving mat for roofing. Basically the kettuvallam was designed to transport cargo and as such many design changes had to be made to make it a tourist vehicle. The height of the roof was increased to get sufficient headroom. A plank was laid all through the length for ease of walking and comfortable seating, to reduce the disadvantages of the curved shape of the hull. Windows and other openings were provided for light, airflow and view. The entrance is provided in the centre of the linear axis with a top hung panel. Most of the latest designs have incorporated three bedrooms with toilets, a living space and kitchen. Of course, there are variations. Some have a lesser number of bedrooms but with a large living space and maybe a deck balcony at the roof level. Normally, the platforms that cantilever from the hull are used as balconies. Innovative changes have been made to accommodate modern fittings. For fixing the toilet seats, shower tray and ceramic floor finish a concrete slab is laid at the floor level. These toilettes are made of steel cabinets with a network of steel meshes on which beneficial bacteria are grown with the help of a catalyst named actizyme. These bacteria feed upon human excreta and produce a harmless germ free colourless byproduct. The soil outlets of the toilet seats are taken through the hull and let out to the flowing water beneath. The use of bio-toilette is common nowadays. Thus the backwater canals are not polluted. The water for use is stored in a plastic tank kept at the top portion of the main body connecting to the kitchen and toilets. The pipes, tank and other synthetic materials are covered with coir or panambu to maintain the aesthetic quality of the eco-friendly materials. Modern houseboats have been designed to meet the Green Palm/Gold Star Certifications by the Department of Tourism, Government of Kerala, which has recently enacted regulations, stipulating the standards of Kerala houseboats or Kettuvallams. Years ago, A. G. Sudhakaran built steel fishing and Kochi's first-ever `junkar' that plied between Fort Kochi and Vypeen. Subsequently, Samudra Shipyard (P) Limited, Aroor, managed by his sons, has given shape to another innovative holiday idea - a traditional kettuvallam made out of fibreglass. This is the first of its kind in India. Kerala was placed among the `50 destinations of a lifetime' by National Geographic Traveler in a special collectors' issue released just before the turn of the millennium. Alappuzha is the citadel of house boats. There are some 120 of them, well maintained and perfected as luxury liners there. The house boats have all the creature comforts of a good hotel: well-furnished bedrooms, modern hygienic toilets, cosy living rooms, a beautiful kitchen and in some cases even a balcony for angling. The crew of a kettuvallam comprises two oarsmen and a cook. Fresh food, cooked in inimitable Kuttanadan style is the rage of the international tourists. Tourists can opt for a day cruise or an overnight stay in a houseboat. Most tourists prefer to stay overnight in a houseboat or kettuvallam as it offers a holistic backwater experience. Tour operators had been coming out with innovative options. The Kannur District Tourism Council has launched a `Nadi Darshan' (river viewing) programme in association with a private resort at Kattampalli as an initiative to popularise the kettuvallam for tourism promotion and as effort to let people know more about the Valapattanam River, one of the largest rivers in the region and the life stream of the district. ^ a b Radhakrishnan, S. Anil. "Cruising along in designer houseboats". The Hindu, 11 March 2002. Retrieved 2008-01-06. ^ a b c "Kerala Houseboat Booking". Green Hope Tourism. Retrieved 21 December 2012. ^ a b "Cargo boats". Worldviewer. Retrieved 2008-01-05. ^ a b c d e "Kettuvallam House Boat in Kerala". Green Hope Tourism. Retrieved 2008-01-05. ^ a b "Unforgettable house boat ride". Alleppey. Travel Division of Kerala.com. Retrieved 2008-01-05. ^ Priyadershini, S. "It's fibreglass and traditional". The Hindu, 22 May 2006. Retrieved 2008-01-06. ^ Mathew, Mony K. "Going beyond God's own country". The Hindu Business Line, 13 July 2000. Archived from the original on 20 December 2007. Retrieved 2008-01-08. ^ Abraham, Tanya. "Eco-friendly boats to ply backwaters". The Hindu, 31 October 2005. Retrieved 2008-01-06. ^ "Valapattanam attracting tourists". The Hindu, 13 March 2006. Retrieved 2008-01-06. ^ Priyadershini, S. "Fish on the boat eating out". The Hindu, 13 December 2007. Retrieved 2008-01-06. Wikimedia Commons has media related to Houseboats in Kerala.